"Wake up each morning to one of the Mentawai Islands most celebrated left hander's, LANCE'S LEFT. It's one of the most consistent and user friendly waves in the entire island chain"
"Being the only resort in the bay combined with a maximum of 12 surfers, guests staying at Kingfisher Resort are guaranteed unprecedented access to Lances Left." Kingfisher Resort is situated in a beautiful bay on the south end of Sipora that overlooks an extremely consistent left hander. What sets it apart from other camps is that there are no other camps in the local vicinity – giving you unprecedented access to one of the Mentawai Islands most celebrated waves, Lances Left. It also means you’ll get plenty of waves to yourself. Surrounded by a number of other secret spots, the camp is also a 15 minute boat ride from the world famous Lances Right. Ideal for intermediate to advanced surfers – the resort is particularly good for small to medium sized groups, families or couples looking for tropical surf vacation. And with consistent waves reeling through the bay all year - this secluded corner of paradise is a must visit destination. Kingfisher Resort can sleep 12 guests within its 2 triple share bungalows & 1 family bungalow. Each bungalow is constructed with beautiful local hardwood timber & includes its own large balcony as well as being 20 metres from the white sand beach that serves as the paddle out to the wave. All accommodation comes complete with A/C as well as hot/cold showers. 2 x triple bungalows - 1-3 guests in each. Ideal for singles, couples & small groups. 1 x family bungalow - up to 5-6 guests. Ideal for a family or small group. - Electrical outlets to plug all devices you may need (220 V). These are Indonesian plugs (same as European). The camps impressive open air restaurant is the focal point of the resort. With views of Lances Left and the adjacent bay, it’s the perfect place to relax and reflect on the day’s activities. Breakfast, lunch & dinner are served at the restaurant with plenty of healthy and delicious meals on offer. Vegetarians can be catered for. New for the 2018 season saw a considerable upgrade for Kingfisher's speedboat. Long gone are the days of getting soaked by sea chop and squalls. Guests have the luxury of traveling in style and comfort to all the breaks. This boat is used daily and isn't just for "special" trips. What you see, is what you get! The resort now also offers trips to both Macaronis (south) and even trips to Telescopes (north). 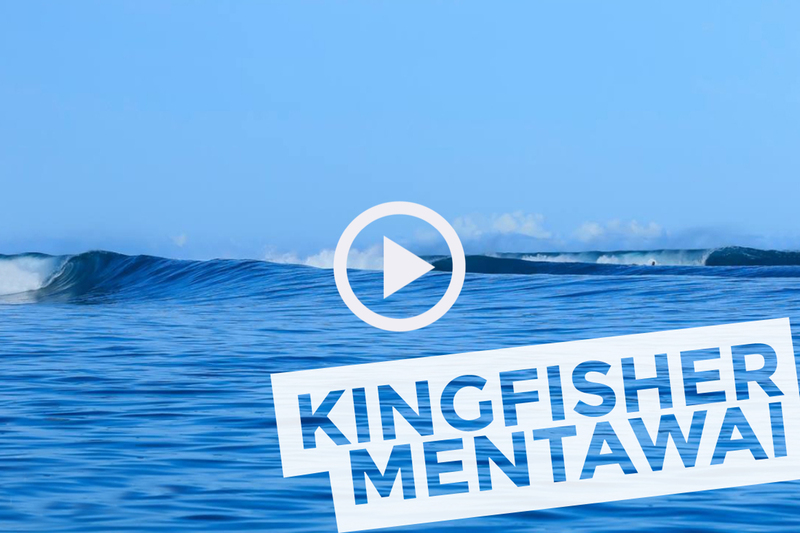 Guests staying at Kingfisher Resort will have direct access to one of the Mentawai Islands best and most consistent waves, Lances Left. And as soon as you've unpacked your boards you're free to paddle out. Being the only camp in the bay, Lances is the obvious focus but HT's & Bintang's are very close by as well as a number of other closely guarded secret spots. Detailed information for all the surf breaks can be found in the destination's section of the site within the South Sipora, Mentawai pages. Upon arrival at Padang’s Minangkabau International Airport, you will be greeted by one of our staff members with pre-arranged transport and you'll be taken to your hotel. From this point we can help with any pre-departure needs, like accessing money, where to eat or simply explore this unique and colourful city for a genuine Indonesian experience. The Ferry crossing time takes around 3 to 4 hours. Guests will arrive in Tua Pejat (Mentawai Port) around 10.00am, where our staff will be waiting to transfer all the baggage to the speedboat and take the guests to Kingfisher Resort, arriving around 11.30am. Crossing times are subject to weather conditions and delays can happen. A private speedboat is available (as an alternative to the fast ferry) - for crossing for groups of up to 12 surfers, starting from around USD 1,550 (tbc). The boat will head straight to Kingfisher Resort and the crossing time usually takes 3 to 5 hours. This is always done in the morning; however the crossing can be postponed due to weather conditions. Indonesian transport is renowned for being erratic, with this in mind delays and re-scheduling are an everyday reality concerning public transportation. We will do our best to get you where you need to be asap, but take no responsibility for delays or cancellations due to external circumstances. Special Offer: 8th - 18th March. bungalow accommodation, return transfers, 3 meals a day, unlimited use of speedboats, fishing and countless barrels. Spots are limited, first come first serve! Available Bungalows; 2 x triple bungalows, 1-3 guests in each. 1 x family bungalow, up to 5-6 guests. By way of payment guests are agreeing to both Kingfisher Resort & Surf Camp Sumatra’s Terms & Conditions. ‍A perfect left, in a perfect bay - what else would you ask for!? The camp is super chilled out and was very comfortable. We had numerous sessions alone with just the Kingfisher guests. Well worth the money and we'll be coming back! ‍Dave was fantastic in booking our trip and everything promised was certainly delivered. The camp was very comfortable and overlooked the line-up, just as pictured in the website. Lots of tasty food always served with a smile. Scored great waves every day. We'll be back. Lances Left all to ourselves! ‍Thanks to Surf Camp Sumatra for organising a killer trip. As with any Mentawai adventure, it's a bit of a slog to get there but it's well worth it. We were lucky enough to score great waves every day. Occasionally there were charter boats about, but we were so much more onto it than those guys. It felt like our wave. If you like left handers then Lances is for you. The camp was super chilled, lovely bungalows. Food was plentiful and super tasty. Service was great. I like to venture to new locations but I'm thinking I'll be heading back sooner than later.